I was about to buy a sheet of EPDM and forego the labor intensive and very expensive task of replacing the sheet roof. Then I saw a video on Youtube for Liquid EPDM. So the research began. “This looks too good to be true”, I thought to myself. But all the videos and customer testimonials couldn’t be made up they came from so many different people. So application day came. I used all the tips and answers I found on the outstanding Q-A part of the webpage and put them to use. I mixed the 1 gallon first, to “cut in”. Mixing took longer than stated, but I’m fine with that. I started at an easy area to get a feel for the product. It brushes on fairly easy for being a thicker product. I used a thin, 4″ roller for the areas under the roof rack. Again, mixing the 5 gallon took a lot longer than stated, but again, I’m fine with that. It’s been a week now, and there were 2 areas I had concern about. 1 area had some “spider web” type cracking that has gone away with curing just like they said it would. The other area had some air bubbles as soon as it was installed. They popped and left little pits in the coating. It appears now, a week later, that those pits are also dissipating as the roof cures. There is a lot of pollen on the roof, so I’m hoping that washes off easy and everything is good under it. So far, I’m extremely happy with this product. if you are doing this in 1 day and don’t have a helper to clean tools, buy 2 mixers. even if you don’t have a question, read through the q-a section on the website. 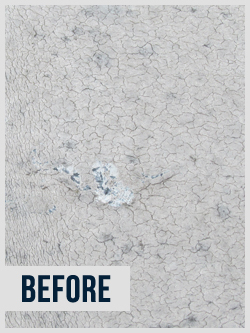 The two pictures are the before and then after using your product Liquid Rubber. Very pleased with the way it turned out! And also the shipping sure came quickly. Have a great and safe day! The epdm rubber roof was easy to work with. I am very pleased after having a leaky roof that will be good for many years to come. Roof had mold on it so we first killed the mold with Clorox and water and scrubbed I down and then cleaned the roof with Dawn dish detergent. Attached are the before and after pictures. My name is Jeremy Berkheimer and I purchased the liquid roof coating earlier this spring. 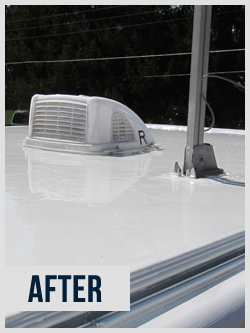 I am attaching the before and after photos of my 38 sandpiper roof. This coating was awesome. It took some real cleaning before hand and a I got a bit of extra exercise spreading it but the finished product seems well worth it. Thanks! Please find attached before and after photos for my camper roof. I forgot to snap a pic of the before, so I had already started applying the Proflex primer when I took the picture. You can still see the condition of the roof though! 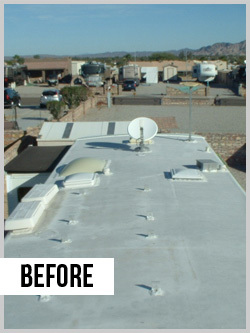 Also, the after pic was after the newly coated roof endured it’s first rainfall. EPDM is amazing. My RV roof was a disaster. I have been battling leaks for a few years now and no other product would stop the leaks or even last more than a few months. Everything else would peel up after awhile. I used the EPDM with the primer. It rained a week later. Zero leaks! The product goes on easy and covers well. No cracks no bubbles. I am very satisfied and would recommend this product to anyone. The are so many products out there and skepticism runs high. Your company and the product did everything it said it would. Just a great product, went on easy and looks great. Just completed my 35 Bus, cut in the rap around sides and around the ACs and vents. Spent the hardest time on cleaning and prep. If you are looking for a product to seal your RV stop looking !!!! Let me tell you this stuff if fantastic. 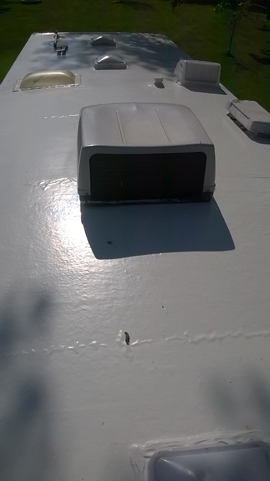 I replaced my roof several years ago and white rubber was not available at the supply company, it was out of stock and I had to replace the rubber as I had ripped the old off. The black rubber made it miserable in here. I did a lot of research looking for a good quality coating that would last and hold up to the elements. I found your product and was convinced, so I ordered and have now applied. 5000 sq ft concrete roof. Prep work consisted of power wash of roof and preparation of seams as see in â€œbeforeâ€ picture. Approximately 7 sets of ProFlex primer was used and 28 Pails of Liquid EPDM Rubber. Cost per sq ft approx. $1.66 . Life expectancy is 18-20 before a recoat is needed. We just wanted to say thank you for these great products. 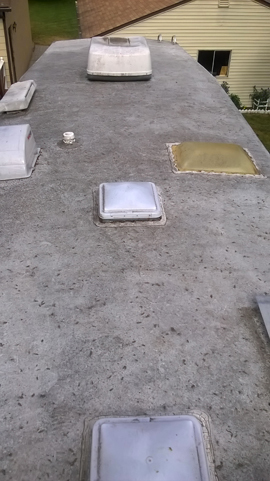 We had been having roof leaks on an EPDM roof which were previously, a very temporarily fixed with FlexSeal. 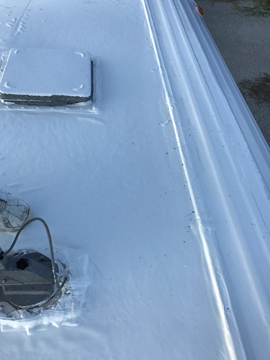 After we applied the primer / liquid rubber solution to these areas the leaks stopped, and the rubber is adhering very well to the existing roof. We’ve also attached before and after pictures for you to use as you wish, as well as for the complimentary $25 AMEX card offer we saw on the receipt. She replied to both of my phone calls very fast and answered all my questions. She along with your companies “Liquid Roof” product just make me want to tell all my RV friends (and I plan on telling everyone). Adrian was so nice to me,I called because I bought a 4 gallon pail to coat the EPDM roof on my 5th Wheel RV,I had though that I had a 4-6 hour pot life after mixing–but hear in Arizona I found out that that 4-6 hour is 2-2.5 hours because of the low humidity and warmer outdoor temperature. I ended up only using about 1 gallon before the product became to tacky to spread,so I ended up throwing out about 3 gallons. (my fault). I had called to see if I could save it ,but Adrian was nice and explained that once its gone its gone and it can’t be thinned. Anyway,. I am still going to use your Great product I will just have to order another 3 gallons. I had a company for over 20 years and I wish I had people like Adrian working for me.She is a terrific person and and a great person representing your company when (Big Dummy’s like me) mess up and call. Applying it was really easy, I would pour some on the roof, then use a roller to move the coating by building a “wave” ahead of the roller to push the coating into the places I wanted “a little extra” coating, then rolled the rest out from that. To get the edges, I simply rolled the coating to the edge and “just over” onto the edge of the rain cap. A couple of hours of work, and I was done. Its been cooler here but one thing I have noticed in addition to no leaks from the roof – our furnace is not running as often! Previously it would turn on 3-4 times per hour, now it turns on 2-3 times per hour. Not a huge change but it helps our propane last longer! I would not say that this is a miracle coating, but it comes close! Our roof if now complete. As you know this was a two year project. 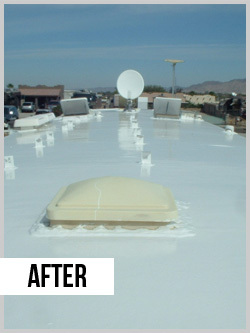 We have a 25,000 ft roof with numerous other coatings on it. 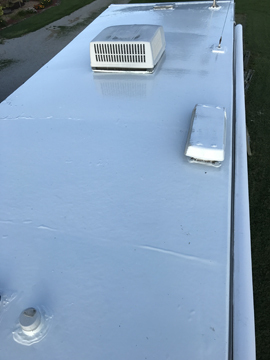 25% built up with at least 4 coats of elastomeric and 25% metal with a Dicor product that we kept reapplying and the other 50% original metal. We tackled the first two parts using your proflex primer and then the liquid epdm rubber. 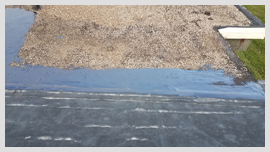 After two years it passed with flying colors we did the job ourselves so I am sure it took longer than it needed but we were extremely relieved and a little surprised that the roof did not leak the first winter after application. Normally that is when we encounter our leaks due to the expansion and contraction of the metal against the coatings. You sales manager will remember me for sure because I was highly skeptical with yet another product claiming to end all roof leaks and also that yours was not so reasonable. To any customers reading this here is a valuable money lesson I learned; if you need brain surgery find the best doctor you do not want to repeat that operation. This is true for my roof for years we kept spending money on top of money for cheap coatings not to mention my staff time up on the roof. 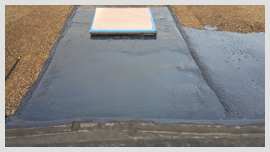 This liquid epdm is not cheap but after my lesson do you really want a CHEAP roof product? I basically spend $1.28 per square foot with this product and over the past 5 years over $5.75 with the other products. Hope this helps those out there with the same situation we were in. Sorry guys I did promise pictures but we canâ€™t seem to find them. My initial feedback is that the stuff is excellent. A real money saver for me as the leaking roof on my 1985 Coachman was making the RV nearly unusable. It did thicken a bit faster than I thought, and it hasn’t rained on the roof yet, so my glowing review is only preliminary. So, at this point your product is batting a thousand. My motorhome is 23′ long and +/- 10′ wide, but one gallon nearly covered the entire roof, which was leaking like a head wound. I’ll take a few pics of the uncovered portion and the covered end, then send them to you. The product may have added years of life to a very old RV. I spoke with Craig about my new roof. He told me to send you these pictures to receive a gift card. My RV is a 1989 Georgie Boy Cruise Master. The roof was supposedly repaired when I bought it. However the repairman did not do a good job as the roof started lifting up while going down the interstate. After repairing the weak areas the leaks started. The entire front half of the ceiling was destroyed. Last summer I removed all the cabinets, and ceiling, then replaced it along with new insulation and roof trusses. I sealed the entire roof with some elastomeric, a competitors inferior product. 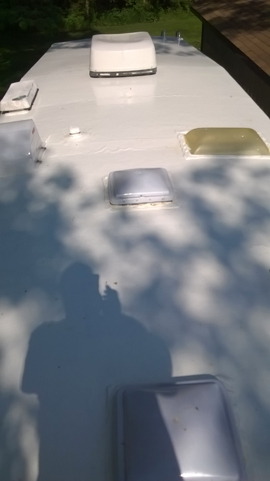 I did not know about EPDM Rubber roof and was not told about it by three different RV dealers that I contacted to determine what was the best product to seal the roof. Well the leaks never stopped. Finally I used window screen and lap seal on all seams and around the edges of the entire roof to stop them from separating. This worked very well. Then I found the epdmcoatings.com web site. I have to admit that I was skeptical after everything else I had tried. However I am simply ecstatic and elated with the results. EPDM is actually thicker and more elastic than a new rubber roof membrane. And it goes on so easily. After the cleaning and prep work, the application was almost to easy. I am a full time RVer since 2002. I know and meet multitudes of RV owners and will definitely tell them about the product. I just do not think I could be any more pleased. Thanks for the instructions. I did call the sales staff again for more info on some more questions I had, which I received polite and good answers making the decision to brush your product on B Deck the only option. While it is a task in doing so, even for a 300 square foot area the instruction covered all aspects of the applications including time and texture of product. lol I’m now waiting for full cure to continue to project and wanted to let you know it looks great and will make a great barrier as per design. Attached photos from applying the primer and black liquid epdm rubber to our residential house. Roof section is L-shaped dog-leg “dog-house” type connection between a circular conical roof section and an L shaped roof. Previous aluminum flashing would only last so long before expansion / contraction of the seams would leak, even though they were nailed down with plastic roof cement between overlaps. Should have used this product a long time ago. Hasn’t rained yet, but I am confident this product is going to be a permanent fix. Thanks for a great product. You can use these photos as desired. We looked at many products before making our decision and we though yours was the most expensive, as it turned out it was the cheapest. Donna walked us through the whole deal. What the contractor originally wanted to do was going to require us to set a primer down first then the tar roof and gravel. We saved over $3500.00 just in the labor alone. Wish we know about your product two years ago when we built our warehouse. Thanks for returning our calls, it’s like pulling teeth to get a return call from some of the other companies out there! We did a lot of research about finding the right product to fix our tin gutters. We had tried many products over the years and they either wouldn’t cure in enough time and would eventually peal. 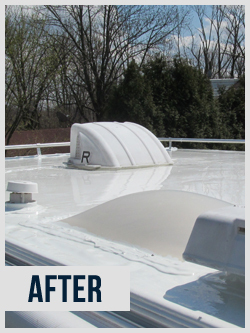 When we tried Liquid Roof, it was love at first sight! It spread on smooth and filled in all of the cracks and folds completely tight. It’s been through winter and spring and has held up remarkably with no sign of wear. You asked us to send you a note on our feedback. As a roofer we have tried many products Sealoflex, Santi-Tred, Snow Roof and everything in between. Yours is what we will be using from now on. We are especially impressed with the flexibility of your product. With the seasonal changes we find this is the major cause for cracking to occur with the other products we have used. I guess it goes without saying….You get what you pay for. Donna you may have recalled me asking if the testimonials on your site were real….well here I am writing you one after using the product. Thanks for all the help for us novices here. I will send pictures later but we completed our warehouse last week and had two good rainfalls and no leaks. We had a few roofers who quoted us $25,000 but managed to get by with $4,500 of your product !! 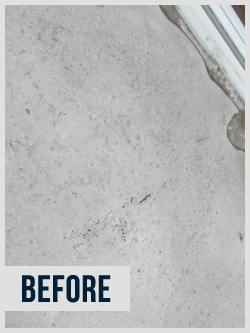 You may want to include with your instructions the fact that the material spreads so much easier with a squeegee and then finish with a roller. In addition after a short period of time the highs and lows seem to blend together and you have a great looking and tight roof again. I found the brushing didn’t work well at all. Attached is a picture of the trailer I used the EPDM coating on. It’s 10 years old and the roof gave out last year. I applied your coating and everything has been “hunky-dory” since then. Thanks for a really good product which is easy to use and DOES the job as advertised. I had a contractor build a patio cover out of cedar and 4×4 glass panes. He never could get the roof to stop leaking though he used several products. Water would eventually always leak somewhere around the joint of the glass and the tin lip he had laid the glass in. I just applied your product and am confident I finally found the right sealant to stop the leaks. I can BBQ in the dry for once without drips all over the patio roof. Great product! I just wanted to drop a line about your product. We have been doing metal roofs for about 12 years now and I think we found the product to end all. Great staff who walked us through our first roof. 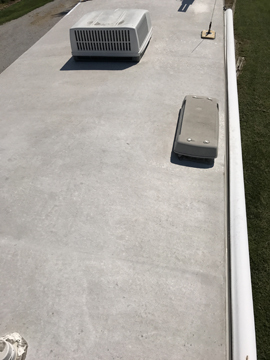 We had a 25,000 sq ft flat roof, mostly metal with some rusting and areas where the vents were covered with a hot tar application. We brushed on an elastomeric coating on the tar areas and on the heavily rusted areas covered them with a metal primer. By the way the product is nice to work with. Given the 8 hour timeframe you have to work with, our guys didn’t have to rush. Not the case with some of the other products out there where the set up is real quick. We were quite amazed with the appearance. It looks like someone put a 25,000 sq ft piece of sheet epdm on our roof. We’ll be back! Had to forward a comment about how happy I am with your product. The order I received back in March of this year worked so well that I decided that it would be the perfect solution to a problem I’m having on another project, so I’ve ordered 2 additional gallons of your Black Liquid Rubber (everyone who has seen this stuff is also amazed!). Once again, great product! I usually don’t take the time to email companies about their service, but I definitely felt the need to for your company. You have a great product and your customer service and shipping speed are second to none!…….Kellie……feel free to use my comments on your site….I’ll be ordering again soon.Sincerely. I had my doubts, and wasn’t sure if I was applying it right, but, it has truned out to be superb. I did manage to get it on my pants. But that is hardly a fault of the product. Excellent product and thank you. I expect my sunroom with the shallow roof is loving it too. After months of trying to decide between a competitors product or a repair or replacement of my flat rubber roof on my garage. I decided to try you “Liquid Rubber.” I am so glad I did! It turned out wonderful! Far better than I would have expected! I am very thankful I chose your product and cannot believe I was even considering another competitors “system”. So glad I didn’t! Easy to mix and easy to apply! It worked great and completely fixed my leaking roof in one shot! The three white five gallons cost me less than $1000.00. Compare that to a new rubber roof installed at a cost of over $8,000.00 or a “professional” repair at around $5-6,000! I can’t say enough about the quality! I did use “Eterna-Bond” tape on the many loose seams. I think that was very helpful. I also really made sure I cleaned the roof first with my pressure washer and cleaning solution. I am attaching several photos at various stages (dates on photo). And you can see how nice it turned out. The amazing “bubbling” has almost gone. It was about this time of year in 2004 that I contacted you about your product. We had suffered substantial hurricane damage in August 2004. Materials and contractors were in very short supply for many months after the storm. I had a flat roof on the back of my home that needed a new hot tar roof but no one was available to do the job and wouldn’t be for several months. In the meantime water was pouring through the ceiling of our lanai each time it rained. I want to let you and anyone reading this know of my experience with Liquid Roof. I’ll tell you the end of the story and then go from there; FANTASTIC PRODUCT!!! (end of story!). I was pulling out of an RV slot that was a “pull thru” and found it wasn’t quite a “pull thru!” The bubble/sky light over my shower was hit by a tree and while the bubble didn’t break it did crack around the base. I attempted an unsuccessful repair and found it leaked terribly. I googled and searched for a fix and found EPDM Coatings.com. I was really skeptical and was honestly concerned that I would pay for a product and it either wouldn’t work or I’d screw it up! Neither is true! IT IS SO EASY AND SO GREAT!! We had 2.5 inches of rain in San Antonio in January and NONE of it was in my RV thanks to Liquid Roof. A couple of hints for anyone thinking about doing this; first DO IT!! IT WORKS!! AND IT’S EASY!! Next, before you start get some old clothes on, some rubber gloves and I would tape off the gutters so that it doesn’t drip into the gutter. Overall this is a FANTASTIC PRODUCT!!! I’m just writting to say Thank you, I’ve receive th material on Sept the 2nd and I was very please with the product,. It arrived intact and I’ve started to apply it on my 5th wheeler roof. It is a thick paint but the coverage is amazing, I am very satisfied with the results. I would like to thank the gentlemen who help me with my order, I can’t remember is name but he was very helpful. I understand that delivery to Victoria,BC Canada was not the easiest thing but it when through, I am very ecstatic that it did. Just wanted to send some “before and after” photos….I am extremely pleased with the liquid rubber. Great product so far. We retrieved the original pictures that we sent to you before beginning the project and took the after shots. There will be one more email sent to you, as all the pics wouldn’t fit on one. You can see for yourself what a huge improvement we have. As I said on the phone, you folks did a great job and the product was perfect. Thanks for your help. I just wanted to send you a testimonial email about your product. We bought a ’99 5th wheel only to find out that it had a leak 3 months later. I had to repair a section of the roof decking and replace a 3 foot section of the membrane leaving a seem on the roof. 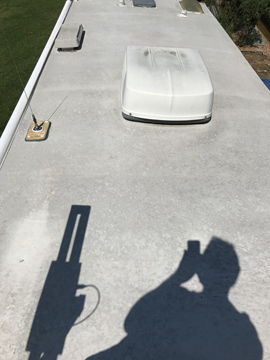 After making the repairs I coated the roof with liquid roof and waited until after we had a rain storm to send you this testimonial. I am happy to report that after an overnight rain storm that dumped over an inch of rain I went in the trailer to find it bone dry! The product was easy to apply and I have even used the left over material on a couple of other projects after placing it in the freezer for storage. I would recommend this product to all RV owners and will probably coat the roof of my next RV with it. Glenn C Palm Beach Gardens FL. i have used this product on over 20 rv roof to help my customers get pease of mind and prolong the life of thier motorhome and campers. This a great product, EPDM Rubber for roofs. It is easy to mix and easy to apply. I had a roof job where a company applied a “torch down” rubber system on my flat roof. They made several critical errors in the application of the torch down. Two added roof repairs and four internal ceiling repairs later and the roof seemed tight. Once you are burned by incompetent roofers you become a cynic quickly. Because of arbitration I got some of my money back. I certainly did not want those bozos back on my roof. That night we had a heavy rain and here is what the roof looked like the next morning. I let it dry out well and about noon I was ready to begin the paint job. As you can see from the above pictures, my roof, which is about 8 years old was losing it’s coating and had many spots which were caused by both bird droppings and “berries” from the local palm trees. I try to clean my roof at least twice per year but it was time to do something about its condition. I started out by mixing the product with the catalyst. It is advisable to rent a mixer that has the power to do the job. The Liquid Roof is very heavy and will burn out a normal 3/8 or 1/2 drill motor quickly. You need to mix it thoroughly which takes some time. I rented a mixer from Home Depot for $12 for a whole day. Well worth it! Here is the mixer I used. It is advisable to have a helper available to hold the can and pour the catalyst into the product. It will take both of your hand and feet to control the mixer as the product is very heavy and thick and causes a lot of drag and twisting force on the mixer. After mixing in the catalyst, you have about 4 or 5 hours of working time with the product. I purchased the product in one 1 gallon can and one 4 gallon can. I mixed up the 1 gallon first and used that to do around all my “stuff” up on the roof and around the entire perimeter of the trailer. 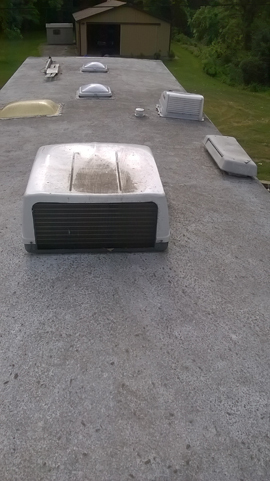 I removed my vent covers for the cutting in and then replaced them before doing the rest of the roof. This used up about 3/4 of the gallon. The rest I used on the top of the roof. The product is supposed to cover about 40 sq feet per gallon if applied as a 20mil thick coating. That turned out to be a very accurate figure as I had only a small amount left when I finished. Here are a couple of pictures of me doing the trim around the edges. That “supervisor” is my good buddy Jim, a retired Navy Master Chief who also helped me with the mixing of the product. After doing the edges and cutting in the opening on the top, I got busy doing the rest of the roof. I made a mistake thinking I would just pour the stuff on the roof and spread it with the roller. It is too thick to just use a roller and a squeege is needed. You pour a line on an area, spread it out with the squeege and then smooth it with the roller. The stuff is self leveling so you don’t have to worry about ridges or getting it perfectly smooth. The idea is to try to get a nice even coat. I don’t have any pictures of this process as nobody else would climb up on my roof and my hands were too sticky to operate a camera. This product is very sticky and you must wear old shoes and old clothes as you will get some on you and the equipment. It cleans up with paint thinner or mineral spirits but I just threw out the squeegee and paint brushes and rollers.